Update – the phone number no longer works for me. A decent alternative is Restaurant Rong Hwa. 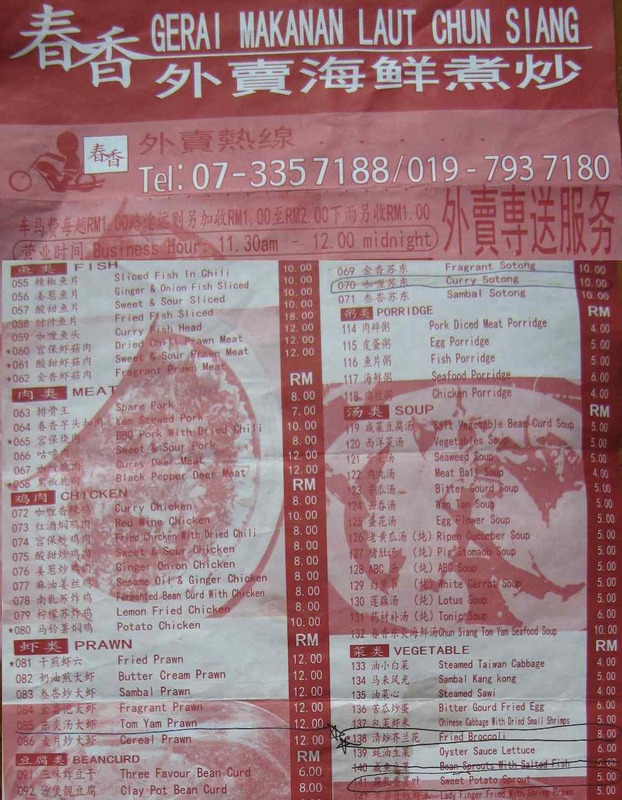 My favorite food delivery in Johor Bahru Central Business District (CBD) is Gerai Makan Laut Chun Siang – it is Malaysian Chinese Food. My favorite dish is Fried Brocoli. I also really like the various sotong (squid) dishes. The long bean omelet is good also. They also have other interesting looking dishes: black pepper deer meet, red wine chicken, egg flower soup and cantonese style kuay tiao. And they have at least 1 dish I have no desire to try: pig stomach soup. 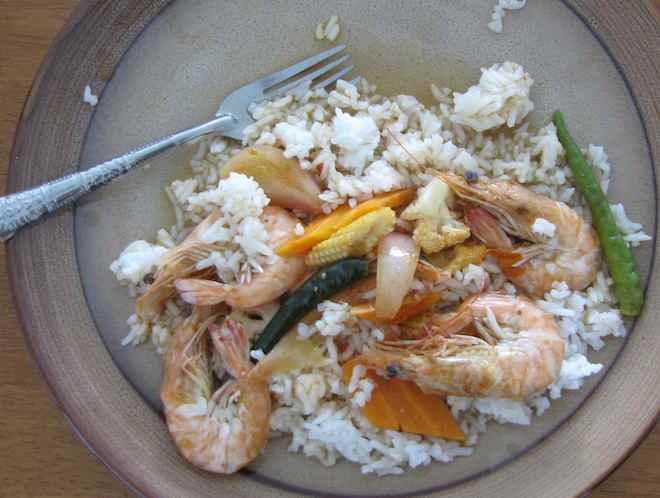 My last meal was Tom Yam Prawn – about half of the order is shown on the plate. Partial menu, I pasted some of the back page under the contact details on the front (which is why it looks odd). Click on the image to see a larger image. It isn’t easy to see the prices without clicking to see the larger image. The meal pictured cost about 24 RM or about $USD 8. Showing how the meal is delivered. 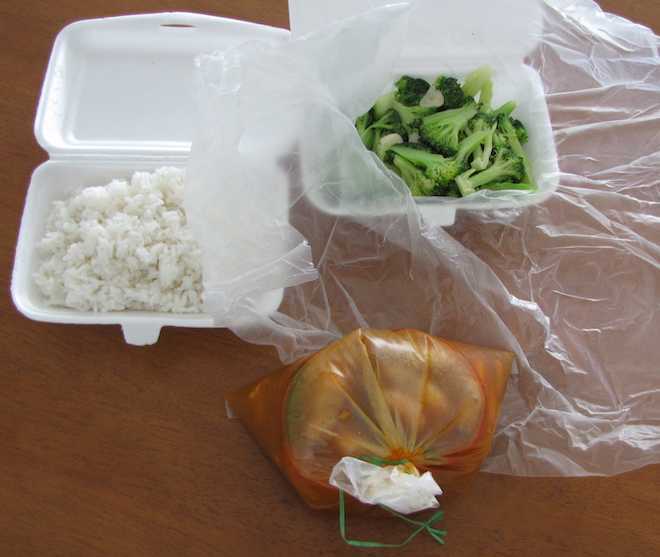 They use plastic sheets to wrap up the broccoli and ship dish (the shrimp dish has ties on the plastic sheet. I am a Malaysian living in JB for the last 3.5 yrs. I moved here from KL. I am an avid gardener and I stumbled onto yr blog because I was looking to buy some pepper plants to plant in my garden. Reading yr blog, you didn’t have much luck with yr pepper plant. I’m wondering whether you know of a place/nursery where I can buy a pepper plant. Incidentally, I live near Bukit Indah. 24 RM seems steep, I’m coming to Malaysia next week, and am hoping for the food to be a bit cheaper? http://malaysia.curiouscatnetwork.com/2011/11/05/growing-your-own-food-with-a-balcony-vegetable-garden/ shows the nursery I used, it is near KSL Mall. They only had seeds to grow plants from. You can also just plant in the seeds from peppers you but at the store to eat (I have some growing right now that way).